At the beginning of the year I came up with a hare-brained scheme to celebrate my 30th birthday in style. I thought it might be fun to come up with 30 different activities to span the whole year. 30 things for 30 years was born. I’m actually surprisingly closer than I thought. And I have plenty-o planned as we reach the end of the year. So I think I might actually do it. For now, here is a quick recap of all my lovely adventures before, some you’ve heard about and some you haven’t. 3 – Olly Muirs – My first ever standing room only concert! 4 – Chatsworth Horse Trials – Ideal if you want to feel posh and horsey! 5 – Disney On Ice – Not sure who enjoyed it more – the kids or me! 6 – Chatsworth Garden Party – A very relaxed, quiet family evening in beautiful surroundings. 7 – Pride and Prejudice Ball – A highlight of my year. Especially the gorgeous dress that a very good friend made just for me! 8 – Bistro Live Birthday Party – An amazing night out with more friends than I knew I had! 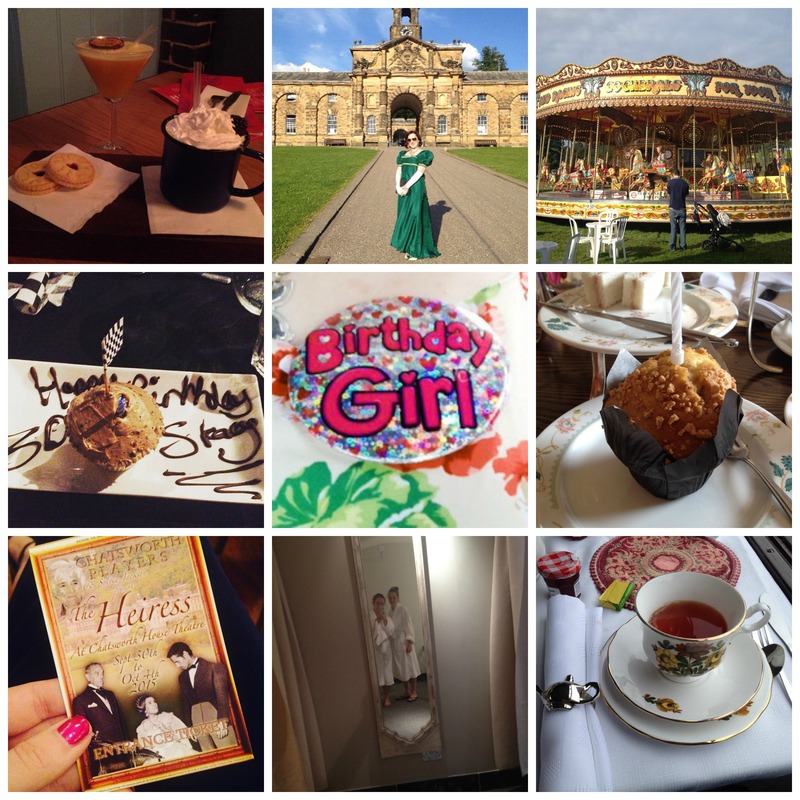 10 –Birthday day out at Chatsworth – A special family day in my favourite place. They even brought me my own birthday muffin! 11 – Open House/BBQ at my mum’s house – Family, food and CAKE!! 12 – Pride & Prejudice Live (Twice!) – The first time I ever saw The Pantaloons perform their unique take on a classic. It certainly won’t be my last! 13 – Chatsworth Country Fair – One of my favourite weekends of the year. Fairground rides, fabulous food and far too many stalls to look at! 14 – “The Heiress” – a fabulous play by the Chatsworth Players. You can read my review here! 15 – “The Importance of Being Earnest” – another cinema showing of a live play, this time featuring the magnificent David Suchet as Lady Bracknell! A-May-Zing!!!! 16 – “Man Vs Superman” – More theatre in the cinema. (I do prefer to see it live but it’s not always possible) This was a funny little play starring Ralph Fiennes. 17 – Spa day with Gemma – A spur of the moment day out with one of my burlesque buddies. Lots of chatting, relaxing and a lovely massage and facial! Blissful! 18 – Eden Hall – A birthday treat for both me and my best friend, Faith. A fabulous day although I haven’t forgiven her for the outdoor boot camp!! 19 – Afternoon tea on a train – Travelling through the Derbyshire countryside while eating a delicious afternoon tea. Can’t beat it!! And that’s it so far. I’m over half-way! Yippee! I do have a lot of exciting plans for the rest of this year, so I will try and keep you updated on those as they happen. The first one is tonight! I’m off to see “The Bodyguard” starring Alexandra Burke! Let’s end this 30th year with a bang! This entry was posted in Lifestyle and tagged 30 things, birthday, cocktails, days out, family, theatre.